Americans overwhelmingly support open transgender military service. 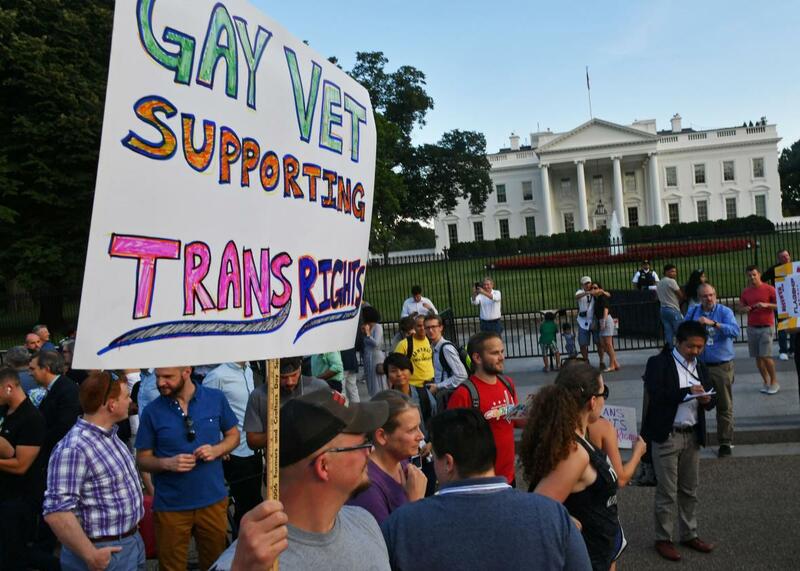 Demonstrators gather in front of the White House on July 26, 2017, to protest Trump’s proposed ban on trans troops. Donald Trump’s plan to ban military service for openly transgender people is deeply unpopular with the American public. A Quinnipiac University National Poll released on Thursday found that 68 percent of American voters believe transgender individuals should be allowed to serve openly in the armed forces. 55 percent of voters in military households support trans service, as do 72 percent of independent voters. 60 percent of Republicans oppose trans service, but “every other party, gender, education, age or racial group” backs it by a margin of 22 percent or more, according to the poll. These results roughly aligns with a Reuters/Ipsos poll released last week which found that 58 percent of American adults support trans military service. That poll also reported a huge gap on the issue between Democrats and Republicans, with 83 percent of Democrats backing trans service and 49 percent of Republicans opposing it. Few Republicans on Capitol Hill, however, have rushed to embrace Trump’s ban, and a number of GOP leaders have spoken out against the proposal. We’ve long known that transgender rights are a winning issue for Democrats. Still, the margins in these polls surprised me given the overall lack of public dialogue about trans service. Why did so many Americans embrace trans troops so quickly? My guess: Most Americans assumed (incorrectly) that the 2010 repeal of Don’t Ask, Don’t Tell opened the military to transgender individuals in addition gay people. Thus, to them, the ability of LGBTQ people to serve openly and honorably is likely a settled issue. We already had a national debate on the matter and came to the conclusion that courageous individuals who wish to defend their country should not be disqualified because of their identity. That was seven years ago. Isn’t it time to move on? Another factor at play here could be the fact that about 15,000 openly trans troops are already serving openly in the military. Trump’s ban, if implemented, would require an exorbitantly costly witch hunt to identify and discharge these troops, who had previously been assured that they could stop concealing their identity. Excluding trans people from enrolling in the military is cruel enough, but purging thousands of already-serving troops would be downright monstrous. America has never invited a new class of people to join its armed forces only to backtrack and throw them out. Trump’s ban would represent an unprecedented attack on our men and women in uniform. Military leaders, including Secretary of Defense James Mattis, strongly oppose Trump’s ban and have declined to implement it until given further instruction. Now we know that most Americans dislike the ban, too; in fact, the numbers are similar to those we saw on the eve of DADT repeal, when a supermajority of Americans supported openly gay service. Trump’s ban may excite a segment of his base, but pretty much everyone else agrees that it’s retrograde and wrong. Americans have made up their minds. And Trump is only delaying the inevitable.